Citrus trees are great in the garden. They look fabulous, have beautiful sweet smelling flowers, and provide wonderful fruit. And the good news is there are citrus for even the smallest backyard. Try dwarf citrus trees if you are short on space. You can grow them in large pots, and even though they are small, dwarf citrus trees can produce a very reasonable harvest. Citrus trees are from the Rutaceae family and are common in gardens all over Spain. They form small, compact evergreen trees, are usually slow growing and have a shallow root system. The best thing about citrus is that they are fairly easy to grow and need little pruning. All varieties ripen slowly and fruit can be stored on the tree to be harvested over months. Remember that citrus love a hot sunny spot and plenty of water. If you are planting them in a pot, use good quality potting mix and feed regularly. Watch for pests and diseases because they can be prone to sucking insects and citrus leaf miner. But aside from these problems, they make the perfect tree for a small backyard, courtyard or balcony. Dig a large hole, remove the tree from its pot and remove any burlap around the roots. Place the tree on a mound of soil. Add or remove soil underneath to adjust the height so that the crown (the transition from trunk to roots) is slightly above it. This will allow for some settling and ensure water drains away from the trunk. Fill in the remaining hole with a mixture of compost or potting soil and the soil from your garden. Citrus trees like a rich well-draining soil. It is always a good idea to also mix the soil with some water retaining gel. 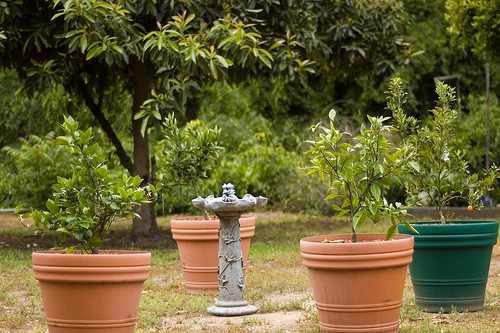 If you are planting a dwarf citrus in a pot, use straight potting soil and fill it in to a similar level. However, do not fill the pot to the edge. Leave some room at the top to allow space to water thoroughly. Place the pot up on blocks and be sure there are plenty of drainage holes in the bottom. Do not let the pot sit directly in a saucer or puddle of water. 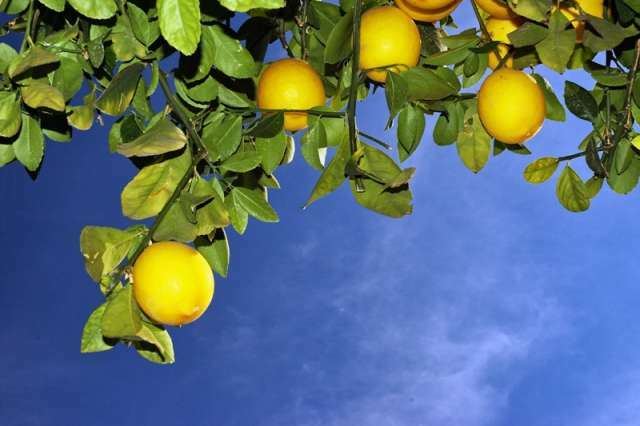 Watering: For sweet juicy fruit citrus trees need sufficient water in the dry season. Water them thoroughly 2-3 times a week. If in doubt if your tree is getting enough water, use common sense and feel the leaves. 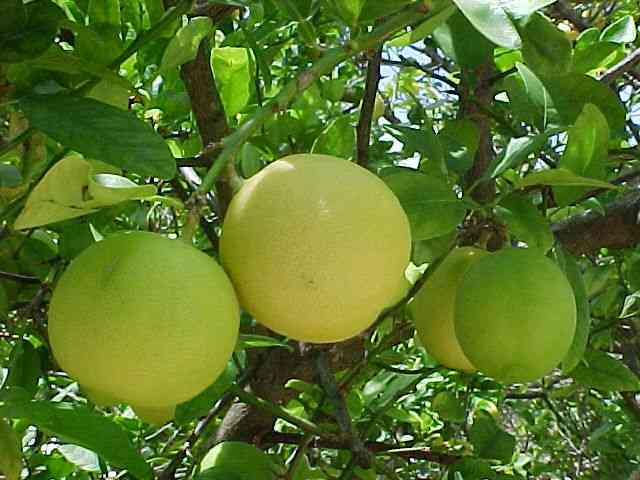 If they feel cool and thick, the tree is fine, but if they feel dry and leathery, the citrus probably needs a drink. Fertilize the tree with an appropriate fertilizer. 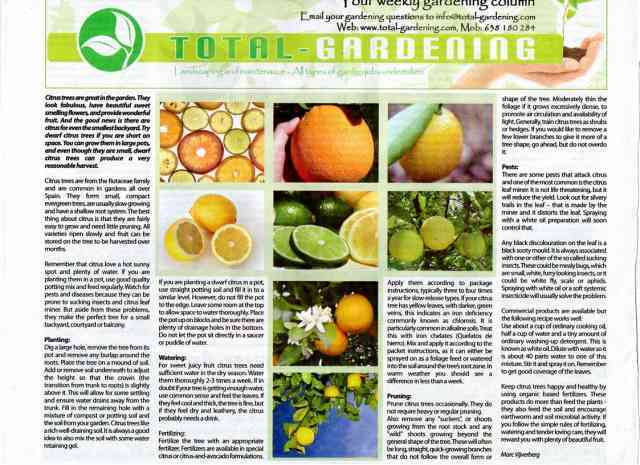 Fertilizers are available in special citrus or citrus-and-avocado formulations. Apply them according to package instructions, typically three to four times a year for slow-release types. If your citrus tree has yellow leaves, with darker, green veins, this indicates an iron deficiency commonly known as chlorosis. It is particularly common in alkaline soils. Treat this with iron chelates (Quelatos de hierro). Mix and apply it according to the packet instructions, as it can either be sprayed on as a foliage feed or watered into the soil around the tree�s root zone. In warm weather you should see a difference in less than a week. Prune citrus trees occasionally. They do not require heavy or regular pruning. Also remove any "suckers", or shoots growing from the root stock and any "wild" shoots growing beyond the general shape of the tree. These will often be long, straight, quick-growing branches that do not follow the overall form or shape of the tree. Moderately thin the foliage if it grows excessively dense, to promote air circulation and availability of light. 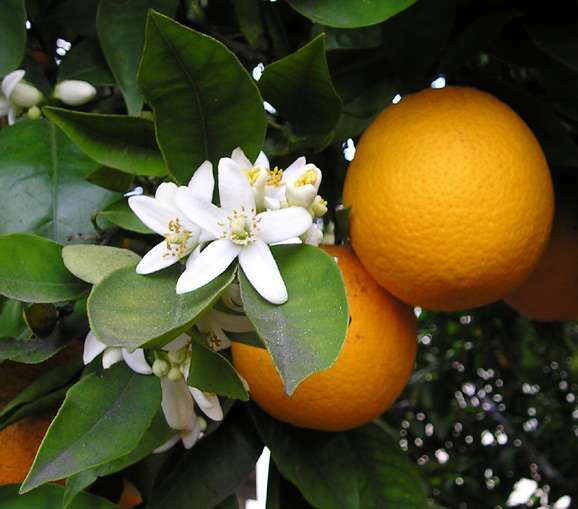 Generally, train citrus trees as shrubs or hedges. If you would like to remove a few lower branches to give it more of a tree shape, go ahead, but do not overdo it. There are some pests that attack citrus and one of the most common is the citrus leaf miner. It is not life threatening, but it will reduce the yield. Look out for silvery trails in the leaf � that is made by the miner and it distorts the leaf. Spraying with a white oil preparation will soon control that. Any black discolouration on the leaf is a black sooty mould. It is always associated with one or other of the so called sucking insects. These could be mealy bugs, which are small, white, furry looking insects, or it could be white fly, scale or aphids. Spraying with white oil or a soft systemic insecticide will usually solve the problem. Use about a cup of ordinary cooking oil, half a cup of water and a tiny amount of ordinary washing-up detergent. This is known as white oil. Dilute with water so it is about 40 parts water to one of this mixture. Stir it and spray it on. Remember to get good coverage of the leaves. 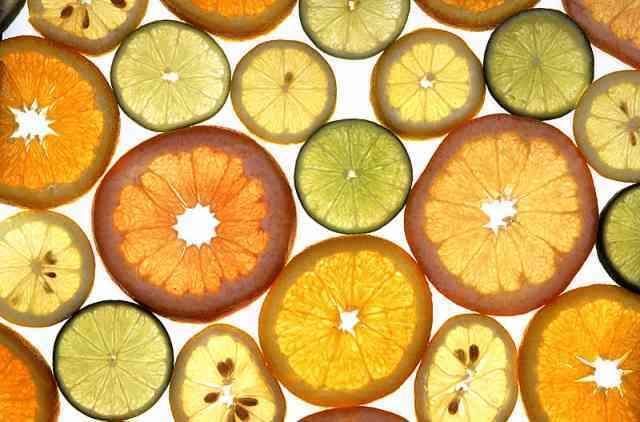 Keep citrus trees happy and healthy by using organic based fertilizers. These products do more than feed the plants - they also feed the soil and encourage earthworm and soil microbial activity. If you follow the simple rules of fertilizing, watering and tender loving care, they will reward you with plenty of beautiful fruit.